Poem of the Week / Hebrew soldiers have arrived! in fingers of poplar or pine. and a new, fragrant rejoicing. in leaves of poplar or pine. From Yarok Efshari (“Possible Green,” M. Neumann, Tcherikover, 1981). This translation from Hebrew by Vivian Eden was first published in Print in Haaretz Books Supplement for September, 2010. Reviewing the past year and looking ahead with mixed weariness and hope, this poem develops around perceptions of time. The first stanza relates to the constant and the cyclical in the culinary year and in nature, the second seems to look at the past of an aging individual approaching death, the third, in “forgiven,” “shriven,” “pain” and birth, offers a complex sense of the possibly better future that follows suffering and the fourth is once again cyclical in a nuanced acceptance – “How many hues between green and green” -- of the slender, variegated and resigned hope for a better year, every year, again. 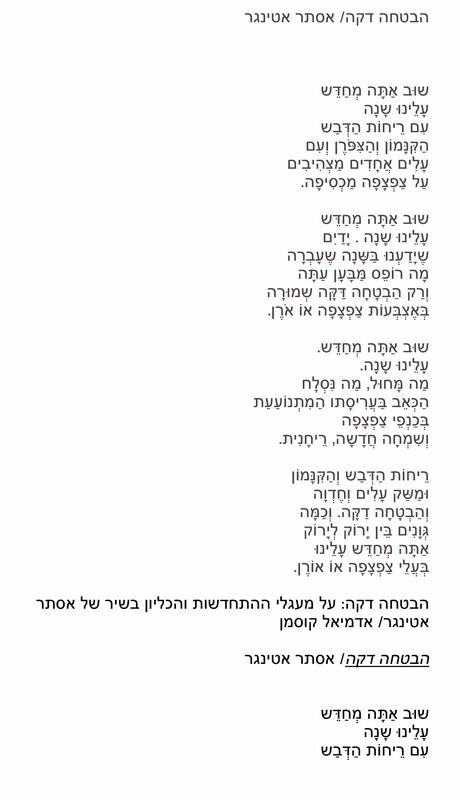 Writing (in Hebrew) in Poetryplace, poet and Talmud scholar Admiel Kosman commented on this poem from the first of the five volumes of poetry Esther Ettinger has published: “It is in fact a prayer. Such a limpid prayer that if the generation were worthy it would certainly have added it into the old High Holiday prayer book … And in the manner of true prayers the speaker has a specific countenance, so much so that even on the first reading of the poem it is immediately evident that we have here a very feminine work. *Musing: Is it indeed obvious that this is a woman’s poem? What makes a poem a prayer? *Bonus: Regarding buying a last-minute honey cake or baking one of your own. Try coffee instead of tea in the first recipe. Here at Poem of the Week, we wish everyone a very much better New Year.